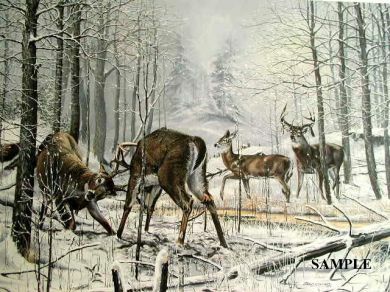 A hunter on the way to his stand almost invisible in the spruce wearing snow camo, comes to full draw on the dominant Buck who is stealing a pondering Doe while the less mature Bucks spar in what the may think is a “Moment of Truth”. All Lithograph prints are on Archival paper, overall size is approximately 17 x 22” unless otherwise specified. If you would like to upgrade your selection, please make your choices from PRODUCT OPTION drop downs below, before adding it to your cart. The Studio offers this same print on canvas with choices of different sizes. Canvas gives the look and feel of an original painting. Remarques are offered in pencil and color. They will enhance your print in value and makes it one of a kind. Remarques are available on paper prints only. You may choose to have your canvas GiClee prints personalized such as your name on a Posted Sign or where ever other proper places may be on the print.